Matthew Kelly came to Louisville in 2014 and talked about living with passion and purpose. In February 2017, St. Patrick Church, Louisville, will host the marquee event from Matthew Kelly’s Dynamic Catholic Institute that is sweeping the country and selling out everywhere. It’s called Passion and Purpose for Marriage featuring author and speaker Dr. Allen Hunt with musical guest George Lower. What’s the most important word in a marriage? What is really going on in your wife’s head? What do you wish your husband knew about you? Discover key ingredients to a healthy and happy marriage during this half-day retreat from 9am to 1:30pm., Sat, Feb 11 at St. Patrick Church. Tickets are $25 per person. Order online at DynamicCatholic.com or call 859-980-7900. Tickets also are available at St. Aloysius Parish Office. Nine (9) other Louisville-area parishes are cosponsoring this event so tickets will sell out quickly. Purchase your tickets today and take your relationship to a whole new level! Questions? Contact Tim Grove at tgrove@stpatlou.org or 719-0362. St. Aloysius School Open Enrollment! Applications are now being accepted for all grades, PreK-8, at St. Aloysius Catholic School. Paperwork can be found at the school website www.staloysiusky.org. There is an open house scheduled for Friday, January 13 from 9:00am – 3:00pm with personal tours given all day. If you have any questions, or want to schedule a tour at another time, please contact Mrs. Hayslip at schooloffice@staloysiuspwv.org. We can’t wait to meet our new Eagles! https://www.staloysiuspwv.org/wp-content/uploads/2016/08/header-logo-3-300x153.png 0 0 Mandy Kumler https://www.staloysiuspwv.org/wp-content/uploads/2016/08/header-logo-3-300x153.png Mandy Kumler2017-01-04 14:12:362017-01-04 14:12:36St. Aloysius School Open Enrollment! Maker Fun Factory is the theme! 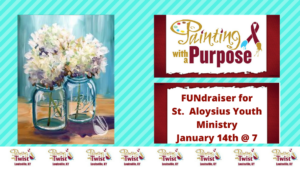 The High School Mission Trip Team is hosting a fundraiser at Painting with a Twist in the Forest Springs shopping center. You will get to take home your own beautiful painting and support a great cause! The event is open to all ages (age 7 and up). This is right in our neighborhood and can be a fun night for the whole family!